"Time to Earn Our Pay"
Excerpt from Joe Hagen's book "Memories of World War II"
It was about a year since our crew was formed at the Amphibious School at Solomons, Maryland. This was followed by boarding our newly launched LST at the Dravo Shipyard at Neville Island near Pittsburgh, taking it down the Mississippi River to New Orleans. There it was commissioned and with shake down cruises in the Gulf of Mexico we sort of learned to operate it. More on the job training followed and we made it across the Atlantic without fatal damage. Now we were being called on to fulfill our real mission, land our troops on the beaches of Normandy. At this time we had not been told what our mission was. It was secret! However we knew that our ship was designed for beach landings, we were in England, the Germans were in France and all big military operations should start in the spring. When we were ordered to Southampton late in May, we had no doubts that D-day would be soon. Upon reaching Southampton the ship was sealed. No one was allowed off the ship except on direct orders from the group commander. Again we just waited. Finally we were instructed to send an armed commissioned officer to receive sealed orders. Since all of the maintenance of the machinery in my department was up to date, I volunteered to go. When the orders were unsealed we learned we were to load troops at Portland and D-Day was set for June 5, 1944. However, then I got news from the engine room which was a real shocker. I was told that the main port engine would stall under load and we were not able to get underway. I rushed to the main engine room and found that the chief machinist mate had removed the cover from the reduction gear and was looking for damaged parts. This is a risky operation because if anything like a wrench or even a fountain pen fell into the gear assembly, the gears could be ruined. I took one look at the gears and told them to button it back up. I then had the chief tell me step by step everything he had done since I left the ship. It turned out that he had disassembled the fuel pump to replace a slightly leaking gasket. He assured me that he had reassembled it exactly as was shown in the big operating manual that had been furnished by the engine manufacturer, General Motors. He was right but GM had made a mistake. The assembly was correct for the starboard engine but not for the port engine. Once this was discovered, the problem was quickly remedied and we got underway for Portland. Portland is a rocky island close to Southampton. The color of the rocks was what prompted the inventor of our common cement to call it Portland cement. The English had prepared a hardened surface, similar to our recreational boat ramps, for loading landing craft and LSTs. Our main deck is loaded by driving the vehicles onto the tank deck and then raising them to the main deck on an elevator. 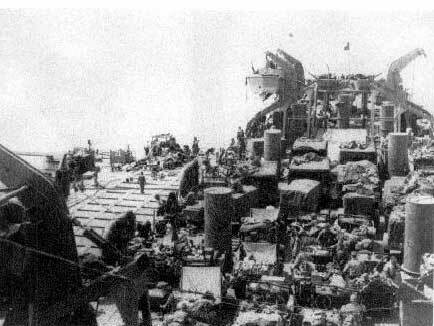 Our main deck load was mostly jeeps and small trucks for a company of the 101st Airborne Division. Then problem developed. One of the mounting legs of the electric motor used for powering the elevator broke. We did not have a spare motor and none was from the supply depot. We made what I had planned to be a temporary repair by wrapping a flat steel bar around the motor and clamping it to the framework. The executive officer questioned if we would be able to unload at our destination and my response was that if the elevator was strong enough to raise the vehicles, gravity would take care of getting them down. After the main deck was loaded, the tank deck was loaded with four 90 mm dual purpose artillery pieces along with trucks and a trailer fitted with radar fire control equipment. At the bow end of the tank deck we had several ambulances and medical support equipment. The two last minute mechanical problems we experienced had brought out odd emotions. I am sure that some of the crew secretly hoped that our part in the invasion would be delayed. However, this was not even vaguely expressed. On the other hand, many felt that we would be disgraced if we did not make it. One of our seamen was carrying a large container of steaming hot coffee down a ladder to the troop quarters on a lower deck. The ship unexpectedly jerked and he lost his balance, fell and was scalded by the coffee. The ship's doctor examined him and decided to send him ashore to a naval hospital for treatment. The seamen actually physically resisted being sent ashore and had tears in his eyes when he was forced to leave. A few were visibly nervous but none wanted to miss the show. We had a chief bosn's mate who had received a purple heart for wounds received on a previous tour of duty in the Mediterranean. He could not sleep at night and would spend the entire night sitting in the forward gun tub staring at the sea but he still was able to perform his duties. Our best small boat coxswain had a wife and small child at home and was extremely cautious. Then just before D-day, he received a letter from home telling him that his wife was having an affair. His attitude changed completely and his caution turned to recklessness. One of LCVPs was trying without success to secure the lift cables so that it could be raised in the ship's davit. The sea was very rough and the coxswain could not maneuver the LCVP into position. Our new superman grabbed a life line and swung out over the LCVP and boarded it. In his first try he guided the LCVP under the davit, secured the hooks and we were able to retrieve it. A barrage balloon along with helium tanks and a mooring cable was delivered to our ship. We were given some brief instructions on how to inflate and deploy it. The concept was as simple as the instructions were brief. The inflated balloon was moored to our ship at an elevation of a couple of hundred feet and we towed it wherever we went. The purpose was to entangle in the mooring cable any Nazi plane that would drop down low enough to make a strafing run. The English had used this technique in an attempt to protect their cities and military installations. We had mixed feelings about their use. The balloons may discourage a strafing run but they sure would help the enemy find us; it was like putting a tall billboard up saying "Here we are!". A water tanker came alongside to top off our fresh water tanks. We were also ordered to reduce our fuel oil supply to a minimum amount for the operation. Having run out of gas in my car several times, my estimate of the minimum was about twice their "recommendation". A messenger came by with some handbills from SHAEF (Supreme Headquarters American Expeditionary Force) signed by General Eisenhower to be read to all hands. I kept a copy of it and include it in these memoirs. Basically it said we were about to invade the main land, things would be tough but we had the stuff to do it. This was June fourth and we were ready to go but the weather was foul. We read later that General Eisenhower agonized about his decision but finally postponed D-day to June sixth. In the meantime our radio operators were receiving news broadcasts from the States that the invasion had begun - so much for secrecy! On the fifth we did get underway for Utah beach. The English channel is over 150 miles wide at this point and we were underway the best part of a day to arrive at our position off the beach at H-hour which I recall as being 6:00 AM. While making the crossing it seemed that most of the thousand ship invasion fleet sailed by. The one ship I remember in particular was a cruiser manned by the Free Polish Navy. The men were in full dress uniforms and stood at attention along both sides of the ship as they sailed by. We were treated to another show at dusk. The large transports carrying paratroopers and pulling gliders filled with troops flew overhead heading for their drop zones. It would be fair to say that our crossing of the English channel was without incident but it was far from routine. Our crew numbered slightly over one hundred. Now we had a company of infantry, a field artillery company and a medical corps on board. This was a load on our facilities particularly our galley. For the crossing our crew was on four on and four off shifts. This gave us the minimum man power to serve all our guns. We had eight Oerlikin 20 mm automatic firing weapons. This required a pointer who was strapped in a shoulder harness and a loader. We also had three dual 40 mm Bofors guns. This weapon employed two pointers seated on the gun mount with hand wheels for tracking and the trigger. One would track the target in the horizontal direction and the other would adjust the elevation. There were two loaders and a team passing the ammunition. In general quarters all hands were on duty including the cooks and mess attendants who manned the guns or formed a human chain to pass the ammunition from the magazines located below decks. We always asked our passengers to help out in the chores particularly in the galley. Some were reluctant but with the Infantry we received all the help we could use. They were use to field rations and our chow was a treat to them. Complaining about service chow was common but actually our cooks and bakers did a good job. We had freshly baked bread all the time and often had sweet rolls and sheet cakes. I encountered one of the soldiers leaving the galley with something hidden under his jacket. I thought it would be something like canned pineapple or fruit cocktail. Instead it was a loaf of bread. No problem here! Our staterooms had double bunk beds and normally each ship's officer had a room to himself. When we carried troops, the army officers were invited to share our rooms and to eat their meals in the wardroom. Since they were on board for several days we got to know something about them. The Captain of the artillery company was a veteran from the African campaign. He had advanced to the position of top sergeant and when the company lost it's officers in combat he received a number of field promotions until he became the company commander. He was a large man and this along with his experience earned the unquestionable respect of his men. He also had faith in his company and said as soon as we could put them ashore they could handle anything. He along with most of our passengers were uneasy about being on the water. He explained that 90 mm rifles were dual purpose, that is they could be used to shoot down aircraft or be employed against land targets such as fortifications or tanks. I had a personal problem deciding what I was to do during various levels of readiness. At general quarters, my station was in the main engine room. Unlike the deck officers, there was no one to relieve me during prolonged periods of alert. I had to eat, sleep and use the bathroom. But I tried to be at my battle station as much as possible. I knew the men were under stress and I thought it helped to see me sweating it out with them. There was a saying that there are no atheists in the fox holes. I do not know if that is true or not but in the engine room one of the men looked up and said "God, I sure wish I had a bottle of Bourbon!". After being in the engine room for many hours, I was so tired that I had to rest. We had some folding stretchers and I spread one out between the main engines and laid down. Now the main engines are twelve cylinder diesels and are quite noisy. However in a short time I fell asleep and slept for about four hours. The watch rotated while I was asleep and although I learned that they poked fun of my sleeping habits, it relieved some of the tension. I think this experience was the start of a weird sleeping pattern. I could sleep in my room while I could hear the noise of the engines but if one of them stopped, I would wake up immediately. After I was discharged and at home sleeping in my own bed, I would sometimes wake up in the middle of the night and when my wife would ask me what was the matter, I would excitedly tell her that the engines had stopped and I had to go to the engine room. The shafts leading to the engine room had a hatch on the main deck. From time to time I climb up the ladder and look out to see what was going on. The deck officers said I looked like a gopher peering out of his hill. At about five in the morning we were anchored at our station off Utah beach. Since we were not underway, I left the engine room and went topside to see what was going on and assist if there were any problems with the deck equipment. The elevator was still a real concern. We were a couple of miles off shore. Visibility was very good with only a slight mist on the water. The sea was calm. We had four LCVP's that were detached from our ship and put in service transporting troops to the beach. We also launched the LCR. This was like an LCVP in size, power plant and hull except that instead of a bow ramp it had a proper bow. It also had an armored cabin with a 50 cal. machine gun. This was in addition to the two 30 cal guns at the stern. What made it really different is the fact that it was fitted with an array of rocket launchers. The normal boat crew was supplemented with a commissioned officer who had special training in the firing of rockets. From our ship we could see the beach being plastered with rocket fire, shelling from naval batteries and aerial bombardment. The army air force had painted zebra stripes on their planes for easy identification. They had not flown any planes with these stripes before and the Germans were not able to use counter camouflage. Mostly we saw P-51 Mustangs and P-47 Thunderbolts. The latter had grown in weight during development and were reported to be a better bomber than a fighter. We did not see any planes that we could identify as being German. Some of our ships were firing at something and we had flak from friendly fire land on our deck. Now the beach at Normandy has a very gentle slope. The tide can rise and fall 20 feet or more. The result is that the beach can be uncovered for a mile out to sea at low tide. When an LST beaches at high tide, the LST will be stranded on the beach until the next high tide. We were not called in to beach because the beach-master did not want LSTs blocking the landing of other craft for twelve hours. If enemy aircraft had been a real problem they would have called us in anyway to put the artillery company in action. As it was the plan was to off load the LSTs on to LCTs and barges. The barges, which were called RHINOs, were made up of sections of rectangular tanks bolted together and propelled by two large outboard engines. For the entire day we just waited. We were at general quarters and had been issued K-rations for meals. We had one meal of them and since things were so quiet, the Captain permitted personnel to be released to activate the galley. We enjoyed real meals again. Since we did not know how long that would last we stuffed ourselves. Although my bowels were doing over time duty, I actually gained some weight during this time. Although we had nothing to do, there was lots of other activity going on. LCTs had carried some tanks from England and landed most of them successfully. Then they started unloading LSTs and cargo ships such as AKAs, APAs as well as some operated by the Merchant Marine. The LCVPs were constantly taking troops ashore from similar vessels. All this was directed from a large communication ship, USS McKinley. This was the flag ship Of Admiral Moon. I remembered his name because we later learned that the stress of being in charge of the operation affected him badly and when he was given a similar assignment for the Southern France invasion, he committed suicide. Although we never had any enemy aircraft targets, from time to time we were ordered to employ our number one defense - smoke. On our stern we had a smoke generator that used diesel fuel and water to make a dense white smoke. Also we had five gallon cans that would produce smoke for about an hour. In one such incident, a DD or a DE made a run around our ship laying down smoke in an attempt to obscure a section of the fleet. There was very little wind and the smoke sat just above the water where it had been made. This made a perfect circle around our ship with us in the middle. It looked like a target had been drawn for the Luftwaffe. As night fell one of our cans of smoke material had burned out but continued to glow a bright red in the dark. An electrician's mate by the name of Donovan saw the danger of this and picked it up with his bare hands and threw it over board. His hands were burned but, with medical dressings, recovered completely. In the afternoon, some of our small boats returned for refueling. They had tried to refuel at the ships they were working but found the ships low on fuel themselves. Since I had not taken the directive about having minimum fuel too seriously, we were able to accommodate them. This caught the attention of other small craft and we had a line form alongside. Our small boat crews had made the landings without harm but were disappointed that we would return to England without them. The LCR that had been launched to bombard the beach with rockets came by with a very dejected officer aboard. He had trained for this operation for months and had reached his assigned position of the beach but then he could not fire the rockets. The type of rockets had been changed just before the operation and he had never received any instructions on how to arm them! A RHINO pulled along side to make some repairs. Our Exec was anxious to assist the crew in every way possible hoping that they would unload us when the repairs were finished. Of course this was not a decision for them to make and when the work was finished they departed for their assigned ship. Eventually, late at night, an LCT came alongside with orders to transport the medical unit to the beach. We opened the bow doors, lowered the ramp and secured the LCT with it's ramp against ours forming a temporary bridge. Although the sea was now quite rough and we had to work without lights, the ambulances and other vehicles were driven across the bridge in good order. The CO of the LCT said that he was to return to us with a load of casualties and we should have our medical team on the alert. He never returned and we later heard that his LCT was sunk on the way back. A RHINO tied alongside for repairs. Vehicles of 101st Airborne Division on main deck. On D-day plus one we finally loaded the field artillery company on a RHINO and the infantry company on several landing craft and were ordered back to Portland for our next load. By now Utah beach was fairly well secured but the weather and high seas were a lasting danger. We watched a number of old merchant ships being sunk to form a breakwater to protect the beach. Large concrete floating structures were towed to the beach to form an unloading causeway which were named Mulberries. None of these structures were in place before we left. Reports about the assault and landings on Omaha beach were that it was really tough and in comparison, ours was a piece of cake. However now both beaches were secured and we anticipated that our build up would be rapid. We were wrong. The whole invasion could still end up as a disaster because of the weather.